The Master Taste Tester remembered his mother occasionally making Beef Olives, and suggested that I give it a try. Unfortunately, he didn’t have his mother’s recipe. Since I had zero experience in making Beef Olives, I did a search for a recipe, and settled on one from Jamie Oliver as a starting point. 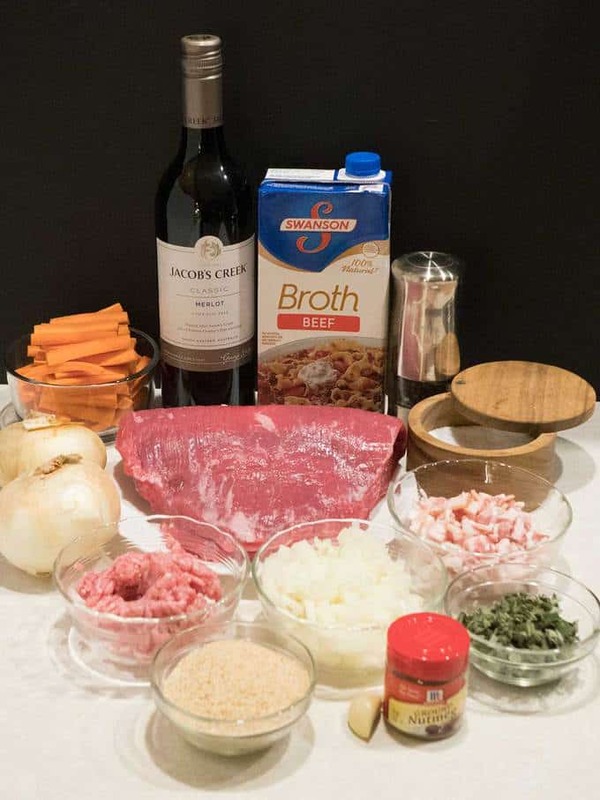 I used the following ingredients: Ground pork, bacon, bread crumbs, onions, garlic, fresh sage, nutmeg, salt, pepper, beef, all purpose flour, vegetable oil, carrots, beef broth, red wine, and dried thyme. The stuffing for the Beef Olives was basically a savory sausage. To make it, I processed the ground pork, bacon, chopped onion, minced garlic, bread crumbs, fresh sage, nutmeg, salt, and freshly ground pepper in my food processor fitted with the steel blade. For the Beef Olives, I started by pounding the beef to a thickness of about 1/4-inch. I sprinkled some salt and pepper on the beef. Then, I rolled some of the stuffing into a cylinder, and placed it in the middle of the beef. 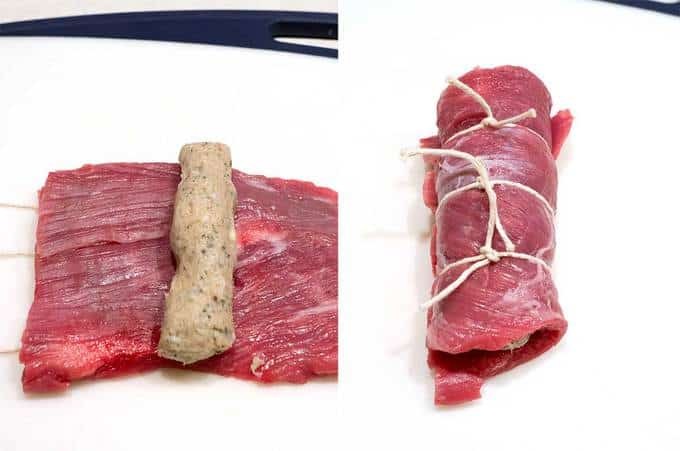 Next, I wrapped the beef around the stuffing, and tied the Beef Olive with some cooking twine. I ended up with four Beef Olives. However, because it was just the two of us, I decided to cook two and freeze the other two. I dusted the Beef Olives with flour, and browned them on all sides in a bit of oil. After removing the browned meat, I added the onions and carrots to the pan, and cooked them over medium heat for about 10 minutes. Finally, I added the beef broth, wine, salt, freshly ground black pepper and dried thyme to the pan, and brought the mixture to a boil. 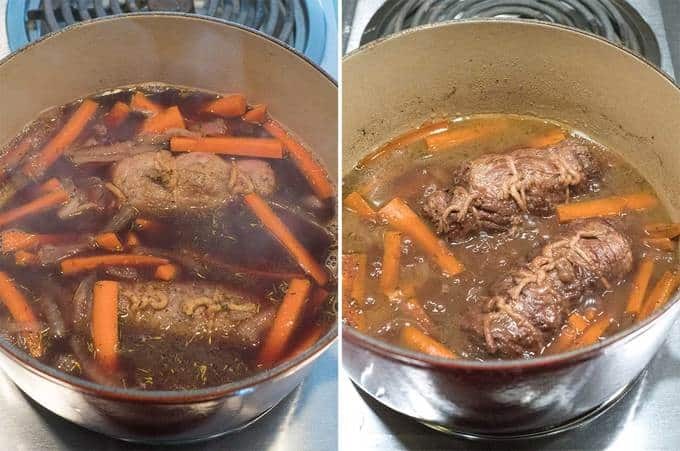 I thought about cooking the Beef Olives in either a slow cooker or a Dutch oven in the oven. At the last minute, I decided to cook the meat on the stovetop in a Dutch oven over medium low heat. Given this, it would have been easier to have cooked everything in the Dutch oven in the first place. Oh well, I was still learning! After three hours of cooking, the meat was literally falling apart! The final step was making the sauce. I started by removing the Beef Olives from the pan, and pouring the liquid into a wire strainer set over a bowl. The Master Taste Tester was horrified that the onions and carrots were going to be discarded. I explained that all of their flavor had been cooked out and was now in the sauce. Using the back of a spoon, I pressed as much liquid as possible from the vegetables. Then, I poured the reserved liquid into a fat separator, before returning it to the Dutch oven. I thought that the sauce was a bit thin, so I thickened it with some Bisto mixed with beef broth. I returned the Beef Olives to the Dutch oven for about 5 minutes to ensure that they were fully heated. Before serving them, I removed the twine. 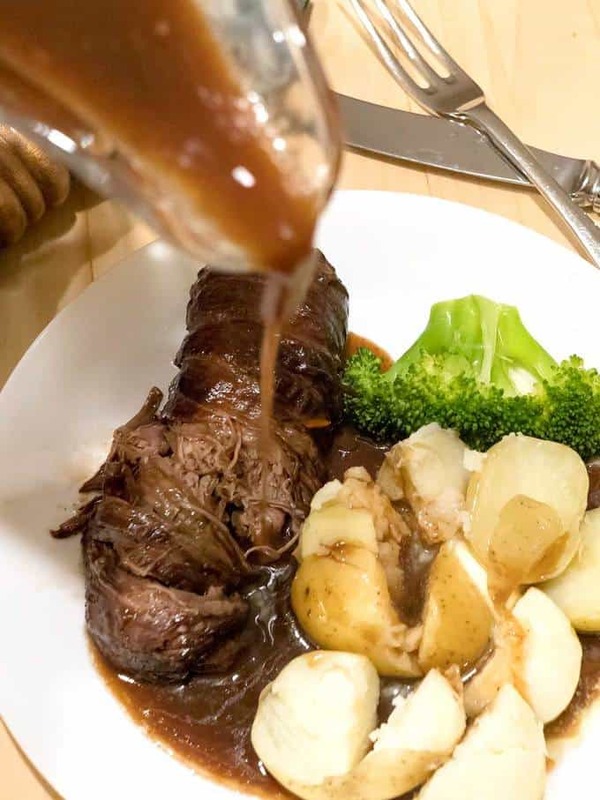 I served the Beef Olives with steamed fresh broccoli and new potatoes, topped with the incredible sauce. They were fork tender and absolutely delicious. Yum! 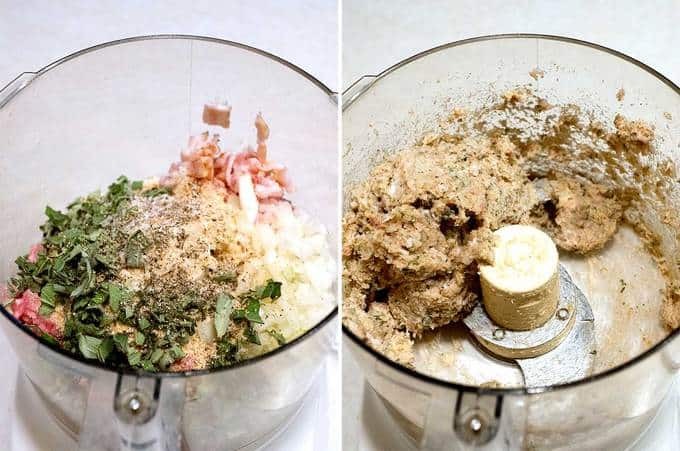 Process all the stuffing ingredients in food processor fitted with steel blade until finely minced, about 30 seconds. Shape into cylinders; set aside. 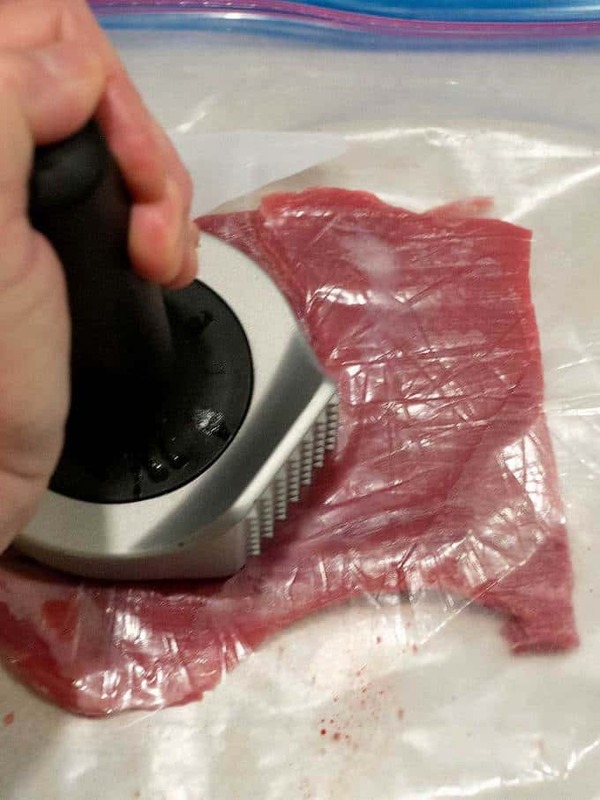 Pound the steak to about 1/4-inch thickness. Season with salt and freshly ground black pepper. Place sausage in middle of each steak. Roll up and secure with kitchen twine. Lightly dust with all purpose flour. To cook, heat oil in a Dutch oven over medium heat; brown the Beef Olives on all sides. 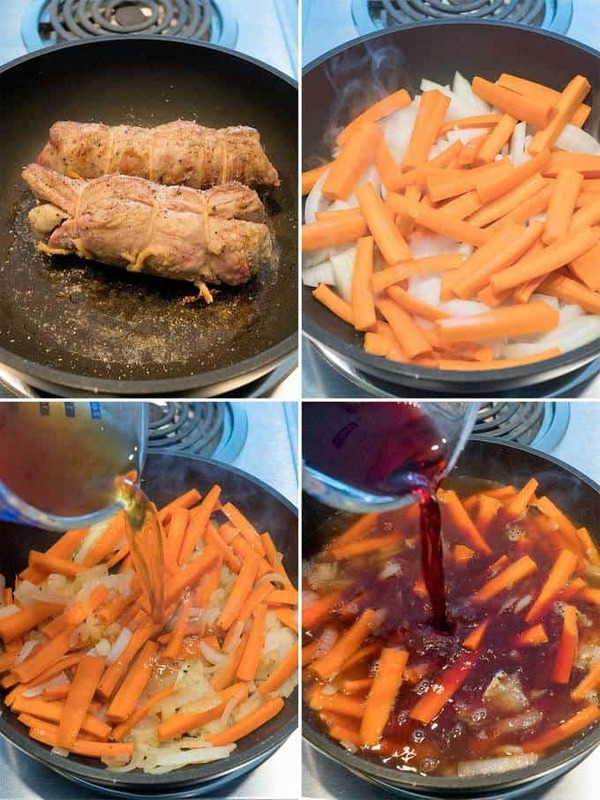 Remove from pan; onions and carrots. Cook over medium heat for about 10 minutes. Add beef broth, red wine, salt, pepper, and thyme. Bring to a boil. Cover, and reduce heat to medium low. Cook on stovetop or in a 325° F oven for 2-1/2 to 3 hours, or until meat is fork tender. Remove Beef Olives from Dutch oven. 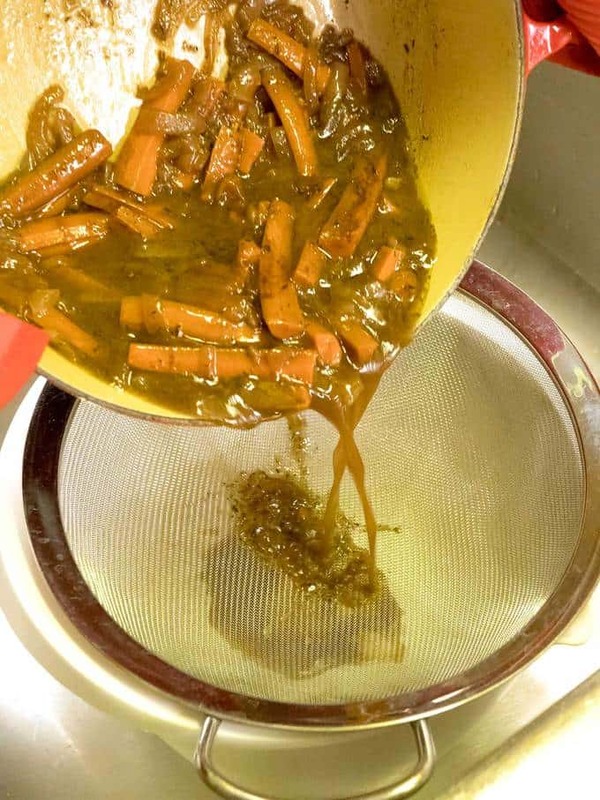 Strain liquid in a wire strainer set over a bowl. Press as much liquid as possible from vegetables. Pour reserved liquid into fat separator. Return liquid to Dutch oven. To thicken, add some Bisto mixed with beef broth to desired consistency. Return Beef Olives to sauce. Heat for 5 minutes or more until Beef Olives are heated through. Remove kitchen twine and serve. Yield: 4 servings. Wow. 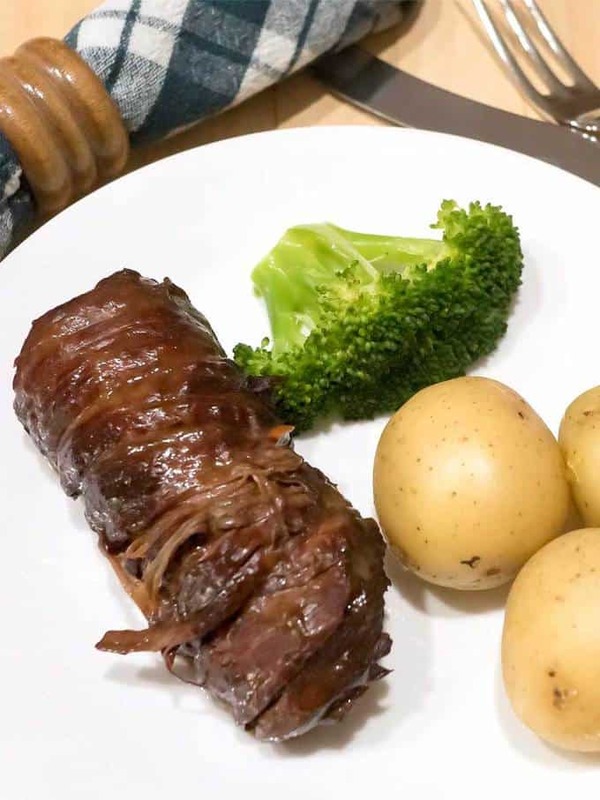 We are big meat eaters in this house and this recipe would go down VERY well. I have made this before - and it is incredible. However, instead of thickening the gravy with Bisto, I just used some of the leftover vegetables, mashed, and it worked perfectly. Yum! Sounds like a delicious alternative to Bisto.